Last season's winner of the QIPCO British Champions Fillies & Mares final at Ascot - Magical, made a fine return to the racetrack at Naas on Saturday. 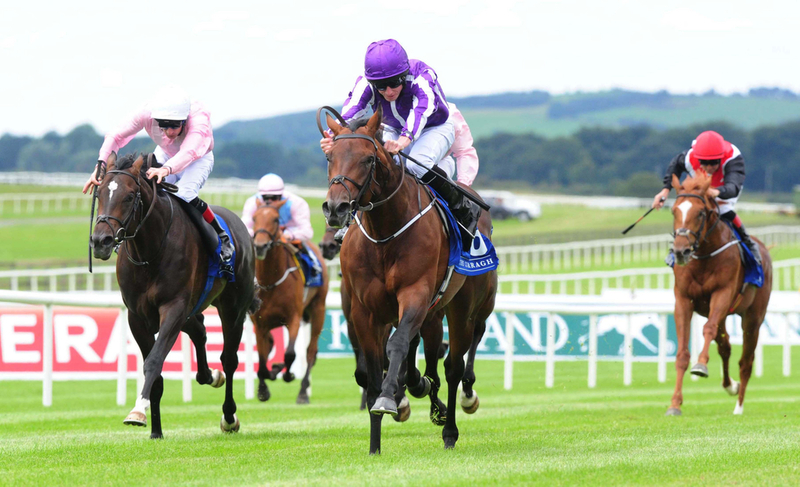 The four-year-old landed the Group Three Alleged Stakes over ten furlongs, leading home a 1-2 for trainer Aidan O'Brien, with Flag Of Honour four lengths down in second. Sent off an even-money favourite, Ryan Moore just had to shake her up entering the final furlong to be sure, but won the race comfortably under hands and heels. A big season now beckons for one of the many daughters to the great Galileo, having landed that Group One at Ascot in October, before taking Enable all the way in the Breeders' Cup Turf at Churchill Downs a few weeks later. Irish Derby winner Latrobe - trained and ridden by Aiden's sons; Joseph and Donnacha, finished a respectable third, but Magical was clearly a class apart. "She has the choice of going for the Ganay in two weeks or go for the Mooresbridge and on to the Tattersalls (Gold Cup). "What we thought we would do is give her a few runs, a little rest and then the autumn. She's physically done very well over the winter, and we were never as happy with her as we are now. "She travelled into the race very well and was just ready to be let go. That should do her good, and she had an easy enough time." The runner-up [Flag Of Honour] certainly did O'Brien proud too, for which he added: "I was very happy with him too. "He doesn't need to go as far as we have run him. He could go for the Vintage Crop or he could go for some of the races that the filly (Magical) goes for. "He's happy making the running, and it is a big season ahead for him too", he finished. Magical's victory recorded a double for messers O'Brien and Moore, after Monarch Of Egypt had kick-started the stallion career of former US Triple Crown winner American Pharaoh, with his first ever runner. The victory was also a first for O'Brien's juvenile brigade this season, and the master of Ballydoyle confirmed the two-year-old's intended targets for the campaign, having made the perfect start. "Hopefully, he will be a Royal Ascot horse - possibly the Coventry Stakes, but he'd need to run again," said the trainer. "He was never away, and you couldn't ask for him to do any more. "He's a straightforward, honest horse who shows plenty of speed - and Ryan said he'd have no problem getting six or seven either.